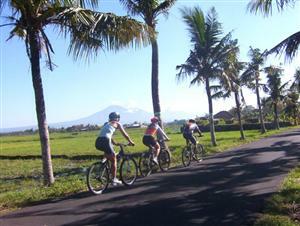 Bike through some of most beautiful scenery bringing into the nature and culture life style of natural Balinese life. 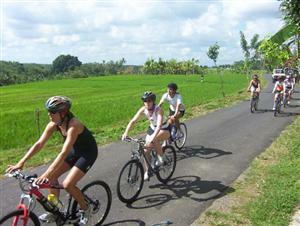 After a fun and healthy morning cycling, than lunch box will be provided at break point surrounded with rice field view. Air conditioned hotel transfer, morning coffee/tea with snacks, refreshment, lunch box and insurance cover. Payment to voucher, hat, sun block or sun screen. short pant and sport shoes. This level is for those with little or no off-road experience. The vast majority of young people can participate and succeed at this level. On the introductory level, you'll find a gentle progression toward more technical trails and skills. At this level some trail experience or fairly good athletic ability is important. If you don't have experience when you sign up, you can spend weekends in the spring getting used to riding off road before your trip starts. We start with moderate trails and the trip will progress faster than the beginner level. On this level solid mountain bike skills and good athletic ability are required for the safety and enjoyment of you and your group. We ride more advanced and extended trails which require greater perseverance and finesse. These trips are not for new mountain bikers; experience on the trails is a prerequisite. Easy riding, flat surface, Village road, low traffic, asphalt, bund (road between rice field), terrace rice view, sunset view, and farm area. 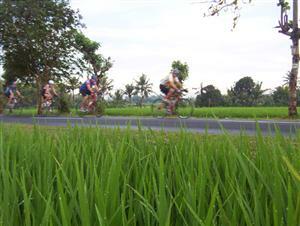 Cross Country, bumpy road, beach rock, bund, sand, asphalt, terrace rice view, sunset view, and farm area. Off road, Downhill, beach rock. Single trail, Tropical forest, Cross country, climb rock, coral, black rock lava Fun bike / MTB Advance. The riding location is point to point or full day by cycling.